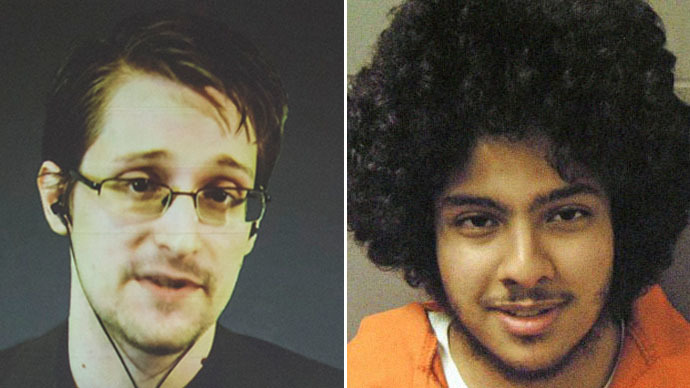 US prosecutors are trying to ban any mention of whistleblower Edward Snowden in the case of 21-year-old Adel Daoud, a Chicago terror suspect – fearing the jurors may disregard the evidence because of the way it was collected. Daoud, a US citizen of Egyptian origin, was arrested in September 2012 during an FBI sting operation. According to the federal prosecutors, he was contacted by undercover FBI agents posing as terrorists in May that year, and discussed a plot to kill a large number of Americans by setting off a bomb at a Chicago bar. The man pleaded “not guilty” to the charges. A court of appeals last year denied the man's defense team to study Foreign Intelligence Surveillance Court records on Daoud although the lawyers said they were required to get ready for the trial. According to the defense, the teenager was targeted by an FBI-orchestrated sting because of computer searches related to a term paper, which contained Osama bin Laden’s name. "Without access to FISA materials, it is virtually impossible for defendants to challenge the lawfulness of the government's surveillance of them," the would-be jihadist’s appeal said in February. #ACLU filing in #Chi#Daoud case says #Snowden revelations created confusion around secret #FISA docs, justifying opening them to defense. And since it was Snowden who earlier disclosed how that court extended the US government’s surveillance powers and didn’t tell anyone about it, this is seen by Chicago prosecutors as dangerous, according to the AP. Since Congress created the FISA in 1978, no defense attorney has ever been granted access to its warrant applications. And there are other problems that have been coming to light relating to the FBI’s conduct in such cases. Defense lawyers in a number of terrorism cases have pointed out that undercover FBI agents not only provided the means, but also incited the suspects to acts of terrorism, often unwittingly. The Justice Department and the FBI have targeted American Muslims in “abusive” counterterrorism sting operations based on religious and ethnic identity, according to the report. The study found that many of the over 500 terrorism-related cases since the War on Terror began in 2001 have alienated the communities that the government should rely on to prevent terrorism.